It's the end of May already and this month seems to have flown by in a rush of birthdays and exams! I have plenty of empties this month though, which I'm excited to talk about. 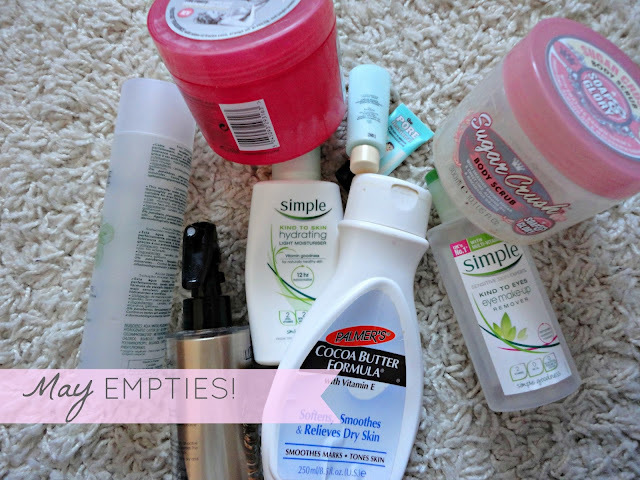 I think empties posts are so fun to do because you get to see well used products and a feeling of self achievement that you've managed to finish something - just me?! 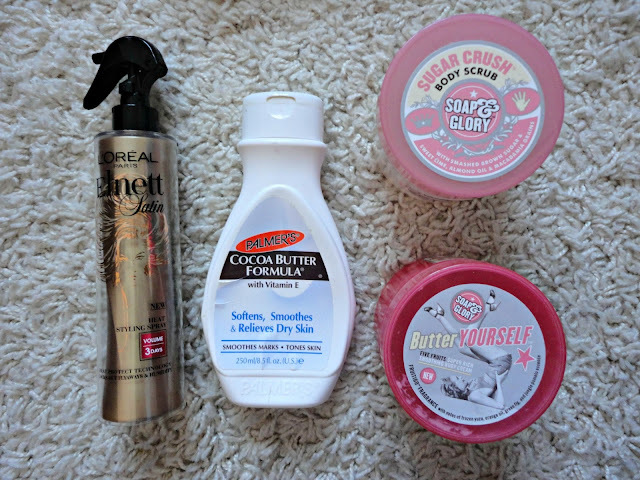 Many of these products have really impressed me too so there's been a lot of repurchasing! 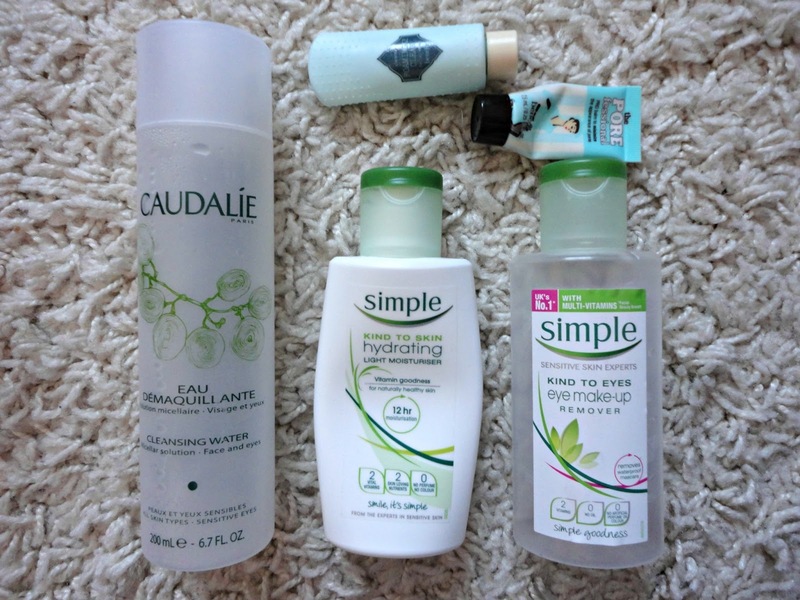 First up is my Caudalie Cleansing Water. This was my first Caudalie purchase and it really impressed me. I really liked the grape scent and the 200ml bottle lasted me a good 2/3 months! However, I didn't repurchase and instead plumped for the L'Oreal Micellar Water - a cheaper and more accessible version. Caudalie have changed it to "make-up removing cleansing water" so I'm not sure if the formula has changed or not. It's also now only 100ml so I'm not sure you'd be getting such a good deal. Next, I finished both my Simple Hydrating Light Moisturiser and Simple Eye Make-up Remover. These are pretty much staples in my skincare routine and although I'm slowly being drawn to the new Origins GinZing moisturiser, I will probably continue to repurchase these because they are so gentle and I've never had a problem using either of them. Finally, I used up two sample-sized products this month. Firstly, the Benefit b.right Foamingly Clean Facial Wash from the b.right Intro Kit. I'm still undecided about the Benefit skincare range but this is a nice facial wash that I would probably use in the morning to wake up my skin. However, I can't really justify the £17.50 price tag for something that's only 'average' so I'm not planning to purchase the full sized version. It is really handy for trips away though! My other sample sized product is also from Benefit: The Porefessional. I remember getting this a while ago and I did use the Porefessional when it first came out but wasn't too bothered about it. However, when I found Nicole Guerriero on YouTube and saw her using it, I dug it out and gave it another try. I have to say, I've been completely converted and love it! I prefer it for it's primer properties rather than disguising pores, but it's so light and I actually really like the velvety texture of it. I actually have another almost-empty tube of this to use up so there's no need to repurchase right now. Next up, I've finished yet another L'Oreal Styling Spray (featured in February & March empties). I think I've repurchased this about 4/5 times now since they came out at the beginning of the year. It's literally the best heat protectant spray I've found and it really does live up to the "3 day volume" claim! The scent is lovely too and it stays in your hair after you've blowdried. I would say it lasts a good month and a half if you blowdry your hair around 3 times a week. Next, an old favourite - Palmer's Cocoa Butter. I got this in my goodie bag from the Company Fashion Forum and immediately fell back in love with the chocolate-y scent. It moisturises really well however it just doesn't last as long as the Soap & Glory body butters. Which moves me on nicely to my next empty: Soap & Glory's Butter Yourself. I got this in one of the many Boots offers, and I'm slowly working my way through the whole body butter range to find my favourite. I've gone back to my old favourite: the Sugar Crush body butter for now. And finally, just last night I finished my Soap & Glory Sugar Crush scrub, which is AMAZING. The sugar and lime scent of this range is just addictive and this is probably the best body scrub I've tried. I decided to try out The Breakfast Scrub next however I will definitely be repurchasing this at some point! And that's it for my May empties! I hope you've enjoyed reading and if you would like a full review of anything please let me know.